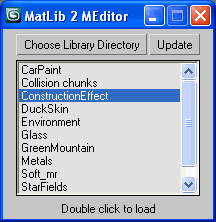 Quick load Material Libraries to the Material Editor. Quick code just from scratch as well. Generally useful for all people that found 24 ME slots for not enough. - Created to improve organizing and retrieving of shaders and their settings quickly.